Anyone looking for class roach fishing could do a lot worse than trying Lodge Lake...where redfins have been going mad on seed baits. 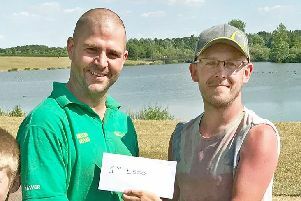 One of the best reported bags – almost 20lb – fell to 'old-master' Ernie Sattler in a vets match, while at least two double-figure roach nets figured in Saturday's league round. 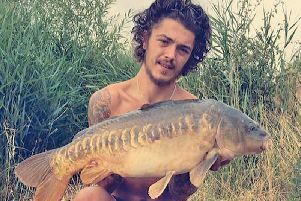 Bream have been moving, too, with at least three 30lb+ match catches, and Friday 13th was far from unlucky for Lou Smith and Steve Lindop as they shared five Lodge carp. ON Tear Drops Roy Crigliano had two nice carp and Gavin Newall a 14-4 as Willards' Tom Ray had a big Furzton double. A number of Willen 20s have been caught, recently. ON the Bradwell Lake Ouse, while others have been bagging silvers, Fishing Republic work experience lad Jack Watson has been getting pike. TEAR Drop 4 produced top weight in the MK summer league round as Black Horse's Rob Dzialak netted 16-14. Ernie Sattler (Tackle Hub) had 13-7 of roach and Maver MK's Terry Lambert 13-4. MK White won and, with two rounds to go, lead on 49 points with 'Hub on 42 and Horse 40. OSPREY, Decoy: Tony McGregor 176lb, Peter Carter 77lb, Colin Drage 69lb. MK Vets, Lodge Lake: John Robinson (10 bream) 40-11, Richard Lattimer 34lb, Gary Underwood 31-4. CALVERT, Claydon Lake, waggler only: Austin Maddock 13-15, Andy Franklin 6-11, Ron Hillier 5-7. John Butler is pictured with his first-ever carp, caught in the club's recent Hill Cottage Farm sweep. TOWCESTER/Nene, Astwell Mill (roach), Mick Goodridge 9-12, Les Goodridge 7-10, Paul Minney 7lb. OLNEY Ouse, Tuesday, Paul Caton 4-1, Sam Corteze 3-3, Dave Keech and Chris Howard both 2-10. LINFORD, Wilderness canal section: Charlie Lancaster 5-11, Roy Hefferon 4-7, Mick Hefferon 4-2.